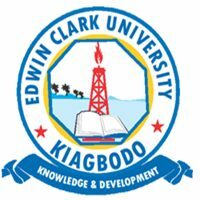 Edwin Clark University Post-UTME Form is Out | Edwin Clark University, ECU post UTME application form for the 2019/2020 academic session is now on sale. See Cut-off Mark, Eligibility And Registration Details. School Fees Per Session of two Semesters is N250,000. This excludes Feeding and Acceptance Fee. School Fees Per Session of two Semesters is N695,000. This excludes Feeding and Acceptance. School Fees Per Session of two Semesters is N395,000. This excludes Feeding and Acceptance.